America Falls Before or After Wormwood? Does the turmoil and destruction caused by a planet x [wormwood] come before or after the ‘demise’ of America (babylon) thru war? It would appear that the destruction of 1/3 of the world by this planet would utterly disable most of the wolds technologies (fuel, food, and electrical energy production/distribution, etc) .. making it nearly impossible for nations to wage war against one another. Not to mention that much of the worlds harbors and ships would lay in destruction also. We can know for sure from Revelation 14’s three angel’s messages that the fall of America the Babylon occurs right before the rise of the Beast at the 5th trumpet that places the mark on everyone. This is because the 2nd angel message announcing the fall of Babylon comes before the 3rd angel message warning not to take the mark (which is introduced at the start of the Great Tribulation). Further, America’s fall must be after the 4th trumpet which is the final effect of Planet X/Wormwood because the first angel’s message warning people to repent happens right before Planet X/Wormwood passes at the 6th seal. Because Planet X happens so fast in the 6th seal through 4th trumpet, it’s doubtful that an enemy attack would happen before the 4th trumpet hits. So I place the fall of America between the 4th trumpet and 5th trumpet for this reason. It makes a lot of sense as you say with infrastructure out that America’s military relies on more than any other country for its advantage that this would be when Russia and her communist allies would strike. If you doubt any nation will have the ability to wage war after Wormwood, then just note that the 6th trumpet speaks of a war between the Beast (essentially the revived Roman Empire with England/the lion at the helm – Dan 7:4 ) and enemies from the north and east (Dan 11:44 – China and Russia) will start a war with him. Also there is the final war of Armageddon after this making a total of at least three clear wars prophesied after Planet X. (A fourth would be the pretrib, pre-wormwood Arab-Israel war coming first). It seems when John saw the 24 elders wasn’t there a mention of a vision? 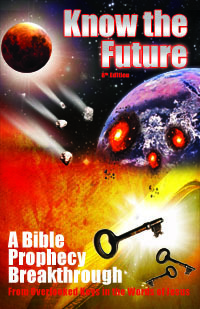 So would it be possible the end time visions seen by John the 24 elders, the saints under the throne were visions of future events as the book of revelation is written? This has not yet come to pass. But our Lord is soon in coming all the prophecies are up!!!!!! It won’t be long. But what I have read will come to pass heaven is ready to receive us. One third of the heavens were swept out with Satan. Are we the one third to take their place? Only wonderingâ€¦..
By all indication, the 24 elders were already in heaven in the present back when John saw his vision of the throne room. Just as the Messiah was already ascended and in his place there. If we take these to be men as the evidence points to, then this makes more sense then saying this in some yet future resurreciton/rapture of only 24 people. I still think the best explanation is that these 24 were “raptured” at the time Jesus was to fulfill the Wave Sheaf prophetic rehearsal of Leviticus 23. If I understand your other question correctly you are asking if we are going to heaven to replace the 1/3 of the angels who Satan marshalled in rebellion against God (Revelation 12)? The purpose for us going to heaven is not because it needs population but because we are not “appointed to wrath” (1The 5:9). Jesus indicated that the rapture would be right before God’s seven bowls of wrath fell. And by the way, the angels are still in heaven today because as Job and Revelation 12 indicate, their casting down with Satan after being banned from heaven is not until the start of the Great Tribulation of his wrath (the reason for the “woe, woe, woe” mentioned in Revelation 12 is the same as the three woes of the 5th, 6th, and 7th trumpets).